Sometimes even a history blog cannot escape from current affairs, but the opposite happens, too: a historical event comes unexpectedly into view and you keep thinking about it. A few weeks ago I encountered the project The Amboyna Conspiracy Trial (Monash University) about a famous trial in 1623 on the island Ambon, part of the Moluccas islands in the southeastern part of the vast Indonesian archipelago, close to Sulawesi, East Timor, New Guinea and Australia, thus explaining the interest of a team at an Australian university led by Adam Clulow. Among the partners for this project launched in 2016 were the Roy Rosenzweig Center for History and New Media at George Mason University, the Dutch Nationaal Archief in The Hague and the India Office Records of the British Library. The website of the project invites the users to ponder the question on which side they stand. In particular the educational aspects of this website merit attention. Here I use both Ambon and Amboina to refer to the island. Yet another reason to write here about the Dutch East India Company is the upcoming exhibition at the Nationaal Archief in The Hague, De wereld van de VOC [The World of the VOC] that will be on display from February 24, 2017 to January 7, 2018. The story of the trial in 1623 is seemingly simple and straightforward. The Dutch authorities on the island Ambon, officials of the Dutch East Indian Company, arrested a Japanese soldier who had behaved suspiciously. Under torture he and fellow Japanese mercenaries confessed to know about a conspiracy of the English to capture the Dutch fortress. In a span of two weeks Englishmen, too, were captured and tortured to gain confessions. Under Dutch criminal law torture was considered one of the legal means in a trial. The Early Modern maxim “Tortura est regina probationum”, torture is the queen of proves, is not mentioned at the project website. On March 9, 1623 twenty prisoners were executed by the Dutch. The creators of the Amboyna website are quite right in seeing this trial as a focus point of history. The Dutch and the English competed for the most profitable trade in spice. In fact the name of the Moluccas in Dutch – now in Dutch Molukken – was for many years “Specerij-eilanden”, The Spice Islands. A treaty signed in 1616 seemed a rather peaceful start of Dutch relations with the inhabitants of the Moluccan Islands, but in 1621 governor Jan Pieterszoon Coen decided to invade these islands, aiming in particular at Banda, known for its nutmeg, apart from Grenada the only spot on earth where you can find large quantities of this fruit which also produces yet another spice, mace. From 1610 to 1619 Ambon was the central location of the Dutch overseas empire in South East Asia. Coen and his troops killed in 1621 thousands inhabitants of Banda and the surroundings islands on the pretext that they had broken the treaty by trading with other nations than the Dutch, be they English, Spanish or Portuguese. This background of ferocious and ruthless violence close to genocide did not predict a peaceful continuation of relations with the indigenous people nor with other European countries. It is indeed the very story that forever divides those applauding the Dutch energy and colonial expansion, and those who condemn the events and the whole period as an unforgivable and inhuman step in mankind’s history. A few years ago one of the episodes of the television series on the Dutch Gouden Eeuw (Golden Age) centered around the 1621 massacre at Banda (the fifth episode, Een wereldonderneming [A world enterprise]. In January 1623 Coen was succeeded as governor of the Dutch Indies by Pieter de Carpentier. The website of The Amboyna Conspiracy Trial gives you a timeline with for each day the texts of the confessions made by the arrested suspects. Four exhibits give you a chance to deepen your knowledges about the two East India companies and the spice trade, the role of Japanese mercenaries, trials in Dutch and English law and the uses and role of torture, and the publicity about the trial. Adam Clulow wrote about the Japanese soldiers in his article ‘Unjust, cruel and barbarous proceedings : Japanese mercenaries and the Amboyna incident of 1623’. Itinerario 31 (2007) 15-34. More recently he published The Company and the Shogun: The Dutch Encounter with Tokugawa Japan (New York, 2014), reviewed for example by Martine van Ittersum for the Bijdragen en Mededelingen betreffende de Geschiedenis der Nederlanden / Low Countries Historical Review 130/4 (2015). Her main criticism is Clulow’s insufficient information about sources in Dutch and Japanese archives. When eventually news of the trial reached Europe, it sparked off a stream of publications. Just browsing the Knuttel, the famous catalogue of Dutch pamphlets shows you a substantial rise in the number of pamphlets issued in 1624 and 1625, but English pamphleteers were even more active. The website features in the “Archive” section only pamphlets in English. You will find in this section some twenty-five sources and a number of paintings and portraits. The presentation of sources for The Amboyna Conspiracy Trial should indeed alert you to what you see and read. For many documents a brief analysis of the text and impact is given, but not for all documents. Some items show just one page of a pamphlet or archival record. No pamphlet is presented here in its entirety. For documents in Dutch a partial translation is given, but no transcription. One of the pamphlets, Waerachtich verhael vande tĳdinghen gecomen wt de Oost-Indien (…). Aengaende de conspiratie ontdeckt inde eylanden van Amboyna (Knuttel no. 3547), online at the portal The Memory of the Netherlands, originally printed in Gothic script (Knuttel no. 3546) was quickly translated into English as a part of the pamphlet A true relation of the unjust, cruell, and barbarous proceedings against the English at Amboyna in the East-Indies (London 1624; digital version at The Memory of the Netherlands). In its turn a Dutch translation appeared of this English reaction (Knuttel no. 3549, online version). 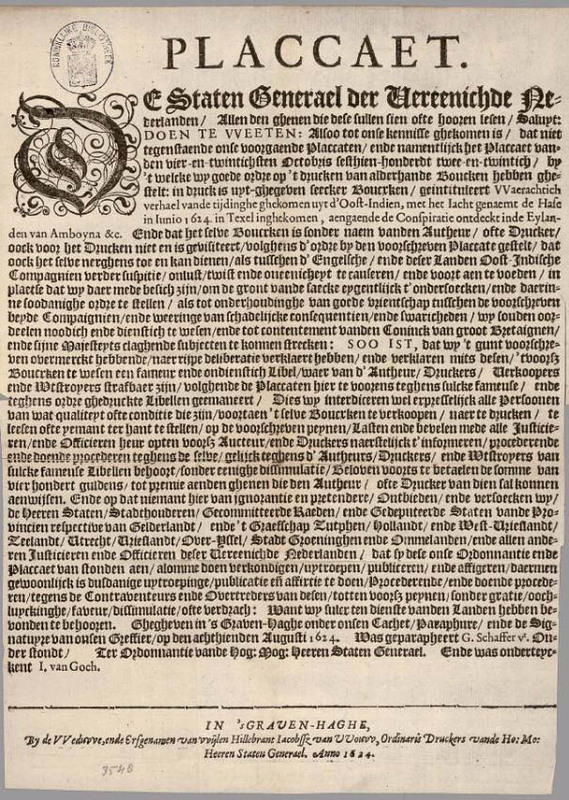 The Amboyna project site does not mention nor contain the ordinance (plakkaat) of the Dutch General States forbidding in August 1624 the distribution of the first pamphlet because it would harm the relations between the Dutch and English East India companies [Placcaet… (The Hague 1624; Knuttel no. 3548, online version)]. Clearly this act did not work to suppress the news of the events in the East. Anyway thanks to the original contemporary translations it is substantially but not completely possible to rely on them. The database The Early Modern Pamphlets Online for Dutch pamphlets and the German Flugschriften does still work despite an announcement about it being shut down on January 1, 2017. You can freely use this online catalogue, instead of going to the subscribers-only commercial version. The Hathi Trust Digital Library has digitized the catalogue of pamphlets held at the Dutch Royal Library [W.P.C. Knuttel (ed. ), Catalogus van de pamfletten-verzameling berustende in de Koninklijke bibliotheek (9 vol., The Hague 1890-1920)], and you can use the search function of this version to search in its text. The “citations” for the archival items and documents at the Amboina website are the titles of the items, with sometimes a very much abbreviated indication of the location and archive. For the colorful painting in the Museum Rumah Budaya in Banda Neira no indication is given when it was created. I can imagine this is exactly the question teachers or instructors want their students to solve. The image of the 1616 treaty with Banda above is marked “Contract with Banda, 3 May 1616”. Here, too, you might think it would spoil the things students have to do if I would give here more information about this source. I had expected a list with full references for all items in an appendix to the project, tucked away in the teachers’ corner. The start page of the digital project shows part of an engraving showing the torturers and their victims. In a corner of the image you can find a reference in small print giving the reference to this image from the collections of the Rijksmuseum (object no. RP-P-OB-68.279, cat. no. FMH 2328-7). The engraving was published in 1673, not nearly fifty years earlier. However, when you start checking you will find several textual witnesses to this treaty, thus making it seem that the image of this treaty – or any other archival record – was taken at random among the registers and originals held at the Dutch Nationaal Archief. The TANAP portal is a great gateway to search for many aspects of the Dutch East India Company both in Dutch, British, Sri Lankan and Indonesian archives. In the combined inventories you will find at least three items with the 1616 contract. The important point is that these inventories do not provide you with digitized images, hence the usual need for good references for documents and images. I would almost leave it to you to search in the TANAP portal for the events at Ambon, but I feel rather certain one of the registers used is Nationaal Archief, inventory 1.04.2, no. 1080, because “VOC 1080” is often mentioned in the citations. Inventory 1.04.02 at the website of the Nationaal Archief contains more than 4 million scanned pages, but not for this register. If you want mores images at your screen you can combine the riches of The Memory of the Netherlands with for example the portal Atlas of Mutual Heritage. The TANAP portal has a fine links selection, and the introduction to the history of the VOC by F.S. Gaastra is most substantial and supported by a fine bibliography. For more links you should visit the site of the VOC-Kenniscentrum. An important general source are the reports of the governors of Ambon, edited by G.J. Knaap, Memories van overgave van gouverneurs van Ambon in de zeventiende en achttiende eeuw (The Hague 1987), digitized by the Huygens Instituut, and you will no doubt be interested in the digitized resolutions of the Dutch Staten Generaal from 1575-1630. The educational purpose of the trial website is very clear in the section Your Verdict. Six major questions are fired at you to help you to come to a balanced verdict about the trial. In my view it is one thing to ask these questions, and another thing to create real full access to relevant documents. However judicious the choice of selections, however wise the suggestions for analysis, you will learn from having at your disposal images of the complete documents, transcriptions and translations, with full references to track them again, and this holds true also for paintings and portraits. This lack of exact information mars the quality of this digital collection. The team has in mind to create similar projects around two other conspiracy trials, but now it seems at some turns that some basic information has been left out to create a smooth and convincing selection. Your judgment on these matters will also depend on your preference for a working educational project which stresses the importance of independent thinking and weighing of facts and views, certainly a major and important aim, or a preference to create a showcase for doing real historical research around a historical cause célèbre. Amidst of all things surroundings this case it is instructive to see the shocked reaction at Batavia (Jakarta), since 1619 the VOC headquarter at Java, of the superiors of Isaacq de Bruijn, the Dutch advocate-fiscal, the senior officer leading the investigation at Ambon. We have to bear in mind that the position of the various members of the VOC united in a number of kamers (chambers) in Amsterdam, Rotterdam and other cities, and the Staten Generaal in The Hague was many thousand miles away. The interaction between the two circles, and even between Java and Ambon was not quick, to say the least. It reminded me of a famous article by the late Cees Fasseur (1938-2016), ‘Een koloniale paradox. De Nederlandse expansie in de Indonesische archipel in het midden van de negentiende eeuw (1830-1870)’ [A colonial paradox. The Dutch expansion in the Indonesian archipelago in the mid-nineteenth century (1830-1870)], Tijdschrift voor Geschiedenis 92 (1979) 162-186. It is the model article in a student guide by P. de Buck for writing history papers and master theses, Zoeken en schrijven : handleiding bij het maken van een historisch werkstuk (first edition Haarlem 1982). It seems this configuration of powers and distances can be dated two centuries earlier. Van Buchell starts telling about the yacht arriving from Batavia on January 1624, and six more ships following within a number of weeks. From “Verhaelden” onwards he jotted down notes about the events at Ambon and his opinion, in my translation: “[They] told also about a conspiracy – note the Latin conspiratio, OV – of some Englishmen and inhabitants of Amboina who aimed at capturing the castle. But they were denounced, some captured, some judged, Englishmen too. As to this it was said the king of Great Britain would hardly be pleased, but – more likely – provoked by his advisors. As if these wrongdoers did not need to be punished! Most of them are being pardoned in England”. Alas these are only notes about this affair, he does not mention it anymore. To me this one note is tantalizing for all the things Van Buchell does not mention, but it is in my view a superficial report showing his first impressions after hearing something about the fateful events at Ambon. He mentions Ambon sixty times in this diary. Perhaps more telling are lines in an undated Latin poem Van Buchell wrote in his diary (f. 74r): Vidimus, Oceanus salsis quod circuit undis / Incola odoriferos ter ubi capit arbore fructus / Amboynae Batavus leges ubi condidit aequas / Fragrantes interque nuces collesque calentes / Bandanos domuit populos, gentique dolosae / Imposuit frenum Javae, regemque fateri / Compulit, aut victum se aut armis esse minorem (…). A quick translation of my hand: “We see how the Ocean goes around with salt waves where an inhabitant takes thrice a year wonderful smelling fruits from a tree, where the Batave has set equal laws for Amboina, and [where] there are perfumed nuts amidst the hot hills; he rules the peoples of Banda, and he imposed a rein on the treacherous people of Java, and he forced the king to yield, be it as conquered or smaller in arms (…)”. The combination of being sure about the qualities of you own laws, and a conviction that peoples on these isles are treacherous, is potentially lethal. It is striking how often Van Buchell writes in this diary about the Protestant missionaries in the Moluccas. There is another VOC diary by Van Buchell yet to be explored [The Hague, Nationaal Archief, inventory 1.11.01.01, Aanwinsten Eerste Afdeling, no. 255 (old 1882 A VI 8 1)]. Now you might want me to leave out Van Buchell, but in fact it helped me to notice the most obvious gap of the trial website. It is rather strange to bother about the full texts, complete transcriptions and translations of documents, and to accept at face value the statements about the differences in criminal procedure in Dutch law and the common law. Instead of translating Van Buchell writing about an analysis by Hugo Grotius would be most welcome. You can consult his correspondence online at the eLaborate platform of the Huygens Instituut. However, Grotius does mention the Amboyna case in his letters only casually. In 1609 Grotius published Mare Liberum, and in 1625 De iure belli ac pacis. His Inleidinge tot de Hollandsche rechts-geleerdheid appeared only in 1631, but this book deals only with private law. Clulow mentions Grotius and the Amboina case in his 2014 study. In an earlier contribution about Grotius I provided ample information about the first editions, online versions and translations of his works. Simon van Leeuwen’s classic handbook for Roman-Dutch law, Paratitla iuris novissimi dat is een kort begrip van het Rooms-Hollands reght (..) appeared only in 1651. While pondering the Amboina case and the project website I remembered another Utrecht view of things. My first steps in the fields of legal history were led by Marijke van de Vrugt at Utrecht, the author of a book about De criminele ordonnantie van 1570 (Zutphen 1978), a study about the ordinance for criminal procedure issued by Philips II of Spain. A few years later she contributed to the series Rechtshistorische cahiers the volume Aengaende Criminele Saken [About Criminal Matters] (Deventer 1982) about the history of criminal law, with a chapter about the 1570 ordinance, and also one about Antonius Matthaeus II (1601-1654), a famous law professor at Utrecht, author of De criminibus (first edition 1644). Van de Vrugt provided judiciously chosen relevant text fragments. She discussed in detail ch. 42 of the 1570 Criminal Ordinance and explains its fateful ambiguity due to unclear words about the exceptional use of torture. Matthaeus questioned the eagerness to use torture. Would it not be most natural to provide for both Dutch and common law more precise information when they clearly were crucial for the whole affair? Lack of space and consideration for the stamina of my readers are the practical reasons to leave out here a paragraph about the common law. Clulow mentioned in 2014 the Amboina case to compare it with a later case in Japan, and pointed for good reasons to Grotius. Alas incomplete understanding and investigating the pivotal role of legal matters for the Amboina case mars the trial website. Despite my remarks and misgivings about a number of aspect of the Amboyna digital collection I think we should salute it as a welcome addition to the materials available for educational purposes. It makes also a number of documents and images easy available for doing research about the Dutch and British East India companies. At the end of this post I wonder a bit what the input of the India Office Records has been. The absence of records from the British National Archives might cause a frown, too. Adding a full list of references for the documents, archival records and images in this digital collection would redeem a clear gap. The Amboina Conspiracy Trial makes you muse about current ideas about conspiracies and the role of one-sided or full information. It is an example of two laws clashing, Dutch civil law administered by officers of a commercial company granted sovereign powers and the common law. It is chilling to note how this example of quick action led to torture and judicial killings of people where other ways to approach the situation were open. The Amboina trial website shows many aspects in a colourful way, but it lacks some crucial information about and attention to the very crux of the matters at stake. It would be relatively simple to provide some background about the Dutch law and the common law, instead of just a few sentences. It might seem evident to focus on the trial itself, but you will have to show even in an educational setting more of the background and relevant sources. Only for Isaacq de Bruijn, the infamous Dutch official, things seemed simple. Our world is complicated, and we had better face it. In my recent contribution about presidential libraries I mentioned the replica of the Situation Room. You will need access to all relevant information, time and wisdom to judge a situation correctly and act accordingly. Even this long post did lack at least something very important concerning Dutch law, the collection of ordinances and placards edited by Jacobus Anne van der Chijs, Nederlandsch-Indisch Plakaatboek 1602-1811 (17 vol., Batavia, 1885-1901), also available online completely at Sejarah Nusantara, a portal for seventeeth and eighteenth-century history created by the Arsip Nasional Republik Indonesia, with both browse and search functions. Soon after publishing my post Adam Clulow contacted me. He has taken the time and trouble to add some of the explications on legal matters I deemed necessary, and he added clear references to the original sources. These changes help indeed to make the Amboyna Conspiracy Trial well worth your attention! This entry was posted in Exhibitions, Peoples and tagged Colonial history, Common law, Comparative law, Digital archives, Early Modern history, Economic history, Education, Human rights, Indonesia, Japan, Legal history, Netherlands, Pamphlets, Trials, United Kingdom, VOC on February 4, 2017 by rechtsgeschiedenis. Dutch colonial history is a subject which since 1975 with the Surinam independence sometimes came into view and in other periods seemed to recede into the shadows of neglect and disinterest. The activities surrounding the remembrance of the abolition of slavery in Suriname have rekindled public attention for this subject in the Netherlands. Since many years the Dutch National Archives helps the Nationaal Archief Suriname (NAS) in Paramaribo in creating finding aids and preparing the transfer of archival collections from The Hague to Paramaribo. Apart from actions for the physical records of these collections, such as restoration and much more, digitization is one of the approaches to make them more accessible both for the people of Suriname and for everyone interested in their history. This week a tweet by the search platform Ga het NA – best translated as “Check it at the NA” – of the Nationaal Archief (@gahetNA) alerted to the online availability of 3,5 million scans, substantial results which merit attention. However, since much information on the websites of these two national archives is only given in Dutch I will provide here a concise guide to a number of the materials which touch aspects of Suriname’s legal history. The translation tools of the famous Grand Omnipresent Web Firm can redeem to some extent the problem of languages, but some guidance is helpful. My interest in these digital archives grows steadily this month because I have at last added a page about digital archives in the digital corner of my legal history website Rechtshistorie. Adding the collections concerning Suriname certainly fills a gap. Instead of preparing this new page in silence and deploring its incompleteness I might as well invite you to look at it, and contribute your own constructive suggestions. In the forty years of Suriname’s independence much had to be done to provide the new nation with a proper national archive. Dutch support was certainly helpful, but not always completely welcome. The history of Suriname is documented in many archival collections at the Dutch Nationaal Archief, not only in those strictly dealing with parts of the Dutch colonial empire. A start at this more general level can illustrate this rapidly. At Ga het NA you can use 115 online indexes. An alphabetical overview of them takes three web pages. The first page contains for example a guide for Ghana, a country connected to Latin America by the slave trade. At the second page you should not only look for Suriname, but also for the West-Indies, in particular an index for pensions of civil officers. The third page continues with more indexes concerning Suriname and three indexes dealing with the Dutch West-Indian Company, one for the registration of investments at its Amsterdam branch (Kamer van Amsterdam) and two concerning the Dutch period in Brazil. In the absence of a good site map at Ga het NA I have to refer you to the Dutch version of the fine research guide for Surinam history. You will quickly understand that politie stands for the police force, notarieel refers to matters dealt with by notaries, and the gouverneurs are the governors. The Raad van Justitie (1671, 1718-1828) and its successor, the Hof van Civiele en Criminele Justitie, were the main judicial courts. The Hof van Politie en Criminele Justitie (1684-1828) was another important court dealing with cases concerning public order and criminal offenses. The Rechtbank van Kleine Zaken was a minor court dealing with smaller cases. The Militaire Gerechtshof was the military court. The section for maps (kaarten) is also generous. Maps in the archival collection of the Topografische Dienst, the Dutch National Cartographic Service, have been digitized, as is the case for the collections Buitenland Kaarten Leupe and Leupe Supplement. The guide gives you also a succinct bibliography and some links to other websites. It would be most helpful to see immediately in such overviews where online scans are available, because this is exactly what many people today will foremost check for at any website. In a post about 200 years Dutch cadastral office I mention more collections with maps concerning Dutch colonial history. Here the NAS scores clearly with a section simply called Archieven online. This overview contains currently 35 archival collections. The largest digitized collection with some 590,000 scans has been created by the secretaries of the government between 1722 and 1828, with some materials even dating from 1684 (Gouvernementssecretarie van de Kolonie Suriname, finding aid 1.05.10.1). Here you will find in particular some registers with plakkaten, ordinances (nos. 612 (1684-1782), 742 (an alphabetical index, 1781-1829), 788 (after 1796-1827)). Finding aid 1.05.11.14, Oud Notarieel Archief is the second largest collection with online scans. You can access here nearly half a million scans of notarial registers written between 1699 and 1828. The nos. 758-768 for the period 1707-1803 are registers of letters of exchange and other documents concerning trade, in particular maritime trade. Register 911 comes from John Martyn, “public notary residing at Paramaribo” between 1809 and 1814, during the period of English rule over Suriname. When you want to approach Suriname’s legal history from a comparative perspective such sources are invaluable. For a combined civil and criminal court in Suriname, you can find digitized archival records in finding aid 1.05.11.13, Hof van Civiele en Criminele Justitie (1828-1832; 2,100 scans). For the same period there are scans of records from the Commissie tot de Kleine Zaken, a court for minor offences (finding aid 1.05.11.4; 533 scans). The collection for its forerunner with almost the same name, College van Commissarissen voor Kleine Zaken in Suriname (1740-1828) (finding aid 1.05.10.05) contains some 133,000 scans. The digitized records of the military court (Militair Gerechtshof) boil down to scans of a single case heard in 1839 (1.05.11.5). Among the 35 digitized collections I would like to point also to the Gecombineerde Weeskamer (1788-1828) (1.05.11.12; nearly 68,000 scans), an institution which dealt not only with orphans, but also with custody cases and belongings (boedels). A major addition to our knowledge of Jews in Latin America are the digitized records of the Portugees-Israëlitische Gemeente (1678-1909). Finding aid 1.05.11.18 gives you some 155,000 scans. You will find among the notarial registers mentioned above some volumes written by jewish jurators. By the way, the scans are currently hosted on a server of the Dutch National Archives. The faded quality of the case record shown here is a useful reminder how much work it takes to preserve and restore to useable conditions of records which survived tropical conditions and will return to a country near the equator. The NAS adds a generous links selection (in Dutch). Hopefully versions in Papiamentu (Sranantongo), English and Spanish will soon be added, following the example of the recently launched Dutch Caribbean Digital Platform, created by the Dutch Royal Library, the University of Curaçao and Leiden University. Its Dutch Caribbean Heritage Collections contains a few digitized books concerning law and government. Let’s not forget the general overview of archival collections held by the NAS. You can trace some 1,100 documents for Suriname and read transcriptions of legislative text using the portal The Dutch in the Caribbean World, c. 1670-c.1870 of the Huygens Instituut, recently moved to Amsterdam. Even this concise introduction to a few highlights taken from a huge number of digital scans should convince you that the two national archives can be proud of their efforts to digitize, preserve and disclose priceless records of a country and a people. Suriname’s present condition is not at all good, but nevertheless it will hopefully help to have both physical and virtual access to records from another period where law and justice did not always reign supreme. Luckily having the originals back in Suriname goes together with creating worldwide access. In January 2017 started also a crowdfunding project to create online access to the slave registers of Suriname. This entry was posted in Peoples and tagged Caribbean, Cartography, Colonial history, Digital archives, Jewish history, Latin America, Legal history, Netherlands, Slavery, Suriname on January 17, 2017 by rechtsgeschiedenis. With the death of Fidel Castro (1926-2016) an era of revolutionary turmoil ends and a period preluding to a transition seems to begin for Cuba. All over the world the events that made Castro a legendary figure, both idolized and hated, will be brought back into view by the media. In this post I would like to look succinctly at some elements of Cuba’s legal history. My overview is coloured by the sometimes random presence of digital collections, but nevertheless it seems useful to bring them together. As a matter of fact I did not search these collections only in the wake of today’s headlines. You can find my selection of relevant digital libraries for both North and South America on my web page with digital libraries which deal with or concern exclusively law and justice. Lately I discussed here Lara Putnam’s article about the dangers of relying too much on digital resources. I hoped to have steered away of some of the pitfalls she indicates, but there is here ample attention for digital resources. When looking at Cuba it is perhaps most fitting to look at this island first of all from a Caribbean perspective. The Digital Library of the Caribbean (dLOC) is a portal created by an international consortium of research libraries. One country gets special attention at dLOC, Haiti. The section for law at dLOC contains more legal materials about and from Cuba than for any other country, some 6,000 items. A search for Cuba as a subject in the DLOC yields nearly four thousand items. You can approach dLOC in three languages. dLOC contains for example the Diario de sesiones del Congreso de la Republica de Cuba from 1902 to 1957. Among the contributing institutions of the dLOC is another digital portal, Manioc, which focuses on former French colonies in the Caribbean. Luckily this portal has an interface in four languages. With only some thirty digitized historical printed books concerning Cuban law and history the harvest here might seem at first insignificant, but the significance is more to be aware of the melting pot of languages in the Caribbean, with not just Spanish, English or Dutch as European influences. A more general search for Cuba at Manioc brings you nearly 2,300 results. dLOC has a special section for nineteenth-century Cuban imprints. The Braga Brothers Collection at dLOC deals with the history of the Cuban sugar industry. At dLOC the revolutionary period of Cuba comes in particular into view with the digital collection of Mexican and Cuban film posters. There is also a virtual exhibit of these posters.In opposition to them stands the collection of digitized Cuban exile newspapers produced in Florida. The film posters can be supplemented by the well-known Latin America Pamphlet Coillection of Harvard University. For pamphlets the Latin American Pamphlets Digital Collection of Harvard’s Widener Library is a starting point. The Digital Archive of Latin American and Caribbean Ephemera of Princeton University contains some 900 items concerning Cuba. Cuba figures, too, at the portal of the Biblioteca Digital del Patrimonio Iberoamericano. This portal is the fruit of cooperation between a number of Latin American national libraries, among them the Biblioteca Nacional José Martí at Havana. I mention the portal especially because it offers you access with a trilingual interface. The digital library of the Cuban national library can only be viewed in Spanish. At the portal you will find for Cuba mainly digitized literary works. You will find the database for the national bibliography useful. Let’s not forget to mention the Archivo Nacional de la República de Cuba and the Instituto de Historia de Cuba. A starting point for looking at Cuba’s legal history might be the digital collection Civil Codes (1800-1923) in the eCollections of Florida International University Law Library in Miami. You can find here the Cuban Código Civil of 1889 and a second edition from 1919. Interestingly this digital collection contains also nineteenth-century codes of civil law from Marocco, Spain, Portugal, Japan and the Netherlands, the last in a French translation [Code civil néerlandais, P.H. Haanebrink (trad.) (Brussels 1921)]. The FIU Law Library has also created a digital collection for Cuban law before 1961, and in the Mario Diaz Cruz Collection you will find materials collected by a prominent Cuban lawyer. Comparisons between the law in sixteen Caribbean countries are possible thanks to FIU’s digital collection Caribbean Law and Jurisprudence with acts, ordinances and case law reports. The Red des Archivos Diplomáticos Iberoamericanos has a section with the main juridical documents from Cuba between 1904 and 1934 and a link to the Cuban Guia de Tratados, alas as for now without any treaty. Yet another example of a digital collection which covers Latin America is the Spanish America Collection at the Internet Archive, created by the John Carter Brown University Library, Brown University, Providence, RI. This library has not just digitized some 3,700 works but also very sensibly divided them into smaller collections, among them one for Cuba. Just 35 books might look a meagre result, but among these books are for example Ignacio José Urrutia y Montoya, Teatro histórico, juridico, y politico-militar, de la Isla Fernandína de Cuba, principalmente de su capital La Havana (Havana 1789) and the treatise Instituciones de derecho real de Castilla y de Indias by José Maria Alvarez (2 vol., Habana 1834). The John Carter Brown Library provides also an important visual collection, the Archive of Early American Images. Among the general digital resources for the history of Latin America I would like to mention also the Early Americas Digital Archive, University of Maryland. The largest quantity of digital collections concerning Cuban history and culture has been created by the Merrick Libraries, University of Miami. The Cuban Heritage Collection with over fiftysub collections covers many subjects. This set of collections is clearly also the core of the Cuban collections at dLOC. It is a matter of choice to look here at them from specific angles or to approach them from a Caribbean perspective at dLOC. It is possible to pursue many avenues and to spend much time in finding more information. Just two weeks ago Mike Widener (Lillian Goldman Law Library, Yale University) wrote about some recently acquired books about Cuban law. Speaking of blogs you might as well go straight for In Custodia Legis, the blog of the Law Library at the Library of Congress. You will find much of interest in the seventeen contributions touching Cuba. For Latin American constitutions you can choose at will from several portals dealing with constitutions all over the world. At my website I mention most of them, but you might want to have here the direct link to the main portal for Latin America, Constituciones Hispanoamericanas, part of the Biblioteca Virtual Miguel de Cervantes. Perhaps more closer to the actual situation at Cuba is the Presidio Modelo, a former prison built between 1926 and 1931 following the panopticon model advocated by Jeremy Bentham. The prison was in use until 1961 and is now a museum. You cannot help thinking that a panopticon model would have suited a particular kind of regime. Fidel Castro himself once was a prisoner here. Anyway, many people were forced to leave or choose to leave Cuba. Duke University has made a digital collection on Caribbean Sea Migration between 1956 and 1996 in which you can find apart from Cuba also Haiti and the Dominican Republic. At Habana Patrimonial, a portal to Cuban heritage, only the links to museums seems to be functioning. Whatever the future might bring for the Cuban people, Cuba and Castro formed an inseparable unit. To the alliteration of these words many will add the name of Kennedy. The Cuban missile crisis of 1962 is the subject of a virtual exhibition created by the John F. Kennedy Presidential Library and Museum in Boston. It is easy to focus on the clash between Cuba and the United States in the second half of the twentieth century, and therefore it seems just to remember here also at least briefly the story of the Amistad. Tulane University has created Slavery and the U.S. Supreme Court: The Amistad Case, a digital collection about the story of a ship with 53 Africans faced with the threat to become slaves. Their voyage to New York started on June 28, 1839 in Havana. Tulane University has also created a digital collection with some 1,800 early photographs of Latin America. For a much wider panorama of Latin American legal history you should not miss Global Perspectives on Legal History, the book series both in print and online in open access of the Max-Planck-Institute for European Legal History at Frankfurt am Main. This institute runs several projects on legal history and Latin America. You might be tempted to think my tour of websites could go on forever! Those who visit my blog more often are used to see contributions with many web links. I provide them for your use, not to chase you away from my blog, but to bring you to resources which are sometimes difficult to find or easily overlooked. Please use these links, it is a pleasure to share them with you, and hopefully they help you to gain insights into Cuba’s (legal) history and culture. One post is always too short to mention everything, but the presence of Cuban legal materials at LLMC Digital merits attention for those able to use them at subscribing institutions. A search at the World Legal Information Institute yields results from 1758 onwards with cases in English reports. The Latin American Interests Group of the FCIl-SIS, a branch of the American Association of Law Libraries, is working on a new online Guide to Legal Research on Cuba. Meanwhile the guide to current Cuban law with lots of links offered by the Law Library of Congress should satisfy many needs. At Globalex Yasmin Morais is responsible for the guide on contemporary Cuban law. In my hunt for relevant digital resources I forgot to look for a relevant edition of the well-known Guía del investigador americanista, a feature of the online journal Nuevo Mundo/Nuevos Mundos. Early in 2016 Vanessa Oliveira and Xavier Calmettes published their fine and nicely illustrated Guide du chercheur américaniste : Enquête de terrain et travail de recherche à Cuba. This entry was posted in Peoples and tagged Caribbean, Colonial history, Comparative law, Cuba, Cultural heritage, Latin America, Legal history, Political history, Slavery, Social history, United States of America on November 26, 2016 by rechtsgeschiedenis. In my latest post the importance of maps for combining both classical and digital approaches for historical research got some attention. It is not a coincidence that I would like to follow this trail by looking at a number of examples, but I had not expected that an exhibition in Utrecht would become the focus point. The Dutch king opened on October 3, 2016 the exhibition Mapping Australia. Country to Cartography (AAMU, Aboriginal Art Museum Utrecht). 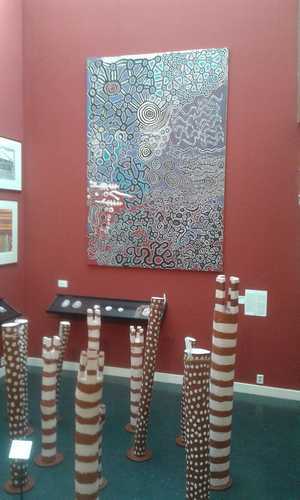 Old maps and modern visions of maps created by Australian artists with aboriginal ancestors are presented here together. The exhibition is a part of the commemoration of 400 years Dutch discovery of Australia in the so-called Dirk Hartog Year, named after the Dutch schipper who in 1616 involuntarily sailed to the west coast of Australia. It offers a good opportunity to look at the digital presence of relevant maps showing Australia at the portal Old Maps Online and the recently redesigned portal Memory of The Netherlands. In 2010 I looked here briefly at this remarkable museum and its collection of law poles. The exhibition at Utrecht shows mainly but not exclusively Dutch maps of Australia. There are also more general maps of the southern hemisphere. The maps have been chosen from the holdings of Utrecht University Library and the Nationaal Archief, the Dutch National Archives in The Hague. Some 2,000 old maps held at Utrecht have been digitized and can be found online at Old Maps Online. The maps held at The Hague come from a special map collection created by the Ministry of Foreign Affairs (Kaartcollectie Buitenland Leupe). The map to the right is one of the items on display at the AAMU and happens to feature prominently in a thematic dossier about Australia at the website of the Nationaal Archief. Among the digitized items of the Nationaal Archief is Abel Tasman’s journal from 1642 (NA, Aanwinsten Eerste Afdeling, no. 121). Tasman, made also drawings of the coastal areas he saw. Perhaps the most stunning historic object comes from the Rijksmuseum in Amsterdam. The very fact it is held in their holdings struck me forcefully. You could argue that the Dirck Hartogh tin dish is not just an object of Dutch maritime history, but also a telling object in Australian history. Dirck Hartogh ordered the carving of his arrival on October 25, 1616 with the Eendraght on the west coast of Australia at the island which still bears his name, Dirk Hartogh Island. Willem de Vlamingh found this dish eighty years after the landing, replaced it with a copy, and brought the original dish back to Amsterdam. Thus the oldest object from Europe that ever touched Australian soil returned to its point of depart in Europe. Old Maps Online has gained its importance as a quick way to find historical maps precisely because it brings together maps from different angles, countries and perspectives. In the case of Australia it matters enormously to have rapid access to these old Dutch maps because they contain details not presented on other maps, and thus they have influenced cartographers elsewhere very much. Any reader of Simon Garfield’s On the Map. Why the World Looks the Way it Does (London 2012) will be aware how not only the actual shape and contents of a map are important, but also the visions mapmakers create. The combination of rich collections from several countries, each bringing both maps printed nearby and in foreign countries, makes Old Maps Online into the rich and invaluable resource it has become. The digital portal Memory of the Netherlands contains now 132 collections from 84 institutions. You can search for these collections and institutions, or choose a preset theme. The theme Maps and atlases yields nearly 19,500 results. However, this filter has been programmed to include also topographical drawings. You can adjust the filters to include only maps which brings you to some 1,400 maps. If I choose for marine charts (365 items) you cannot search immediately for a specific location. In its current look it is more practical to look for a location in general and subsequently narrow your search to maps or charts. The portal gives access to an impressive total of nearly 800,000 items. Depending on your search question, either a general question which you want to explore or a more restricted one, you will encounter many interesting items. It is still possible to view the famous topographical collections such as the Atlas Schoemaker directly. This double use of the word atlas should serve as a reminder that even though digital materials might have been digitized with a view to historical research the sources themselves were not made with this intention. For the purpose of this blog post you should perhaps begin with the digitized atlases from the holdings of the Nationaal Scheepvaartmuseum in Amsterdam. The historical maps of Australia form a major part of the exhibition at Utrecht, yet the modern art works which either mirror old maps or reflect concepts of space and spatial representation attract rightfully your attention. In particular the work of Judy Watson invites you to rethink the role of maps, especially the names of locations. The Dutch and English deliberately gave their own names to Australian locations which of course had and have their own names given by the indigenous people of Australia. Apart from drawings and paintings there are also minor objects to be seen, such as beautifully carved shells, and some larger objects, a number of law poles. Interestingly, the law poles belong to the main collection of the AAMU. They are part of a series of contemporary art works which have helped setting the boundaries of land belonging to indigenous people. This theme was itself the focus point of an exhibition at the AAMU in 2010 about which I reported here briefly. I cannot help thinking now that these law poles are here very much museum objects instead of being elements of the present state of affairs in Australia regarding indigenous people. The past years a number of contemporary Australian art works has been shown around Australia in travelling exhibitions. 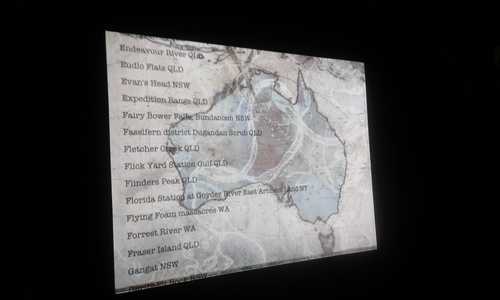 Any of my thoughts to be just looking at an art exhibition was dispelled when I spotted among the place names projected in a video installation by Judy Watson on a map of Australia Cape Grim and the Cape Grim Massacre. Watson’s point is not only recording such grim places as Cape Grim and Suicide Bay on Tasmania, but showing the sheer impact of a majority of English and Dutch names for Australian locations. The Dutch might not have occupied physically much Australian territory at any time, but giving locations a Dutch name was definitely done with to commerce and control. Van Diemen Land and Tasmania are not exceptional examples of lasting Dutch influence. I would like to mention here the online Companion to Tasmanian History, edited by Alison Alexander, Centre for Historical Studies, University of Tasmania, where you can pursue this approach and much more. At the website of the Dirk Hartog Year you can find in the section Dirk’s Library information about his life and voyages for the Dutch East India Company, and not as you might expect books about him or even his personal library. I could not help inspecting the transcriptions of some of the historical records – including the tin dish from 1616 – and noticing gaps and misunderstandings. Instead of frowning upon this situation it is better to point to a brand new website about Early Modern Dutch palaeography, Wat Staat Daer? [What Is Stated There?]. Three archives in the province Noord-Brabant launched this website earlier this month. Even if it is not a tutorial it does give you not only a number of documents to decipher, but also a digitized version of a handy booklet by Willem Bogtman, Het Nederlandsche schrift in 1600 [Dutch Handwriting in 1600] (Amsterdam 1938; reprint 1973) showing you the variety of forms of letters in Dutch documents. Some users of Wat Staat Daer? point to an online tutorial for Early Modern Dutch palaeography of the University of Amsterdam. 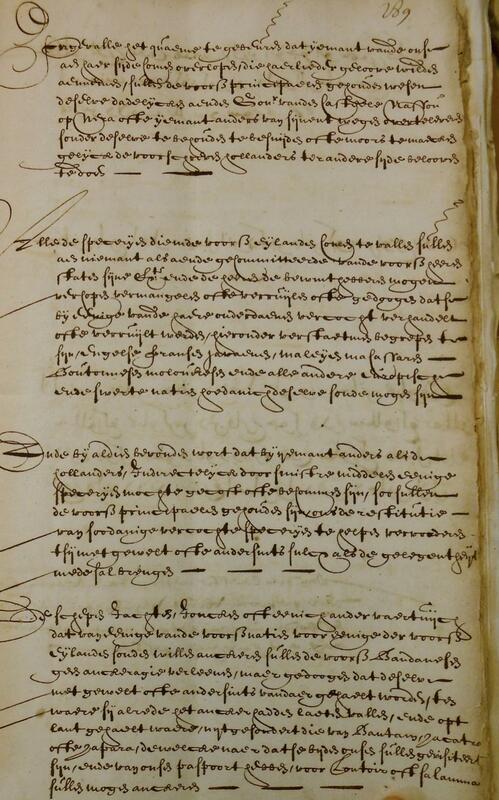 One user gives the link to a website for Dutch sixteenth-century palaeography using records of criminal justice at The Hague for a very short period, 1575 to 1579; in particular the reference section is very useful. Hopefully these websites help also all those investigating traces of Dutch history in locations from New York to Brazil and from South Africa to Sri Lanka and Indonesia or the global impact of the Dutch East India Company. The VOC Kenniscentrum and the Atlas of Mutual Heritage are among the virtual harbors where your research into the history of the Vereenigde Oostindische Compagnie can start. The municipal archive in Amsterdam has a special page about Dirk Hartogh, with a discussion also of the various spellings of his name. For those wondering why I do not mention here the Digital Panopticon, a project combining data from the Proceedings of the Old Bailey Online 1674-1913, the Convict Transport Registers Database and the First Fleet to create a history of English and Australian people over the centuries, I did so here in an earlier post about the Digital Panopticon. This project is not only a showcase for digital humanities, it showcases also legal history in fascinating ways. Among the many activities of the Dirk Hartog Year some of them are clearly connected to the events of 1616, its immediate impact and historical influence. The Western Australia Museum created a small but interesting online exhibition, 1616 – Dirk Hartogh. At the website of the Duyfken 1606 Replica you can find more information about important Dutch voyages to Australia in the seventeenth century. This autumn the replica of the Duyfken is sailing along Australia’s west coast in remembrance of Dirk Hartog’s journey. The Nationaal Archief gives an overview of other Dutch activities concerning “1616” in 2016 and 2017. The Dutch National Archives have produced a glossy magazine with the flawed title Boemerang. Nederland-Australië 400 jaar, which you can download as a PDF. I feared it was only available in Dutch, but luckily the website of the Dirk Hartog Year contains a link to the English version. The choice of subjects in this colourful magazine is really not narrow-minded. It would be one-sided to leave out here the websites of the National Archives of Australia and the National Library of Australia, but enough is enough. For me writing this contribution has been in some way a voyage of discovery, although I have collected over the years a selection of links to websites touching Australia’s legal history on my legal history website. Hopefully I can seduce you to look out for uncharted territories, to rethink the importance of historical and linguistic borders, and to get inspiration from artists who raise difficult questions about our own time. This entry was posted in Landscapes, Peoples and tagged Art, Australia, Cartography, Colonial history, Early Modern history, Indigenous people, Legal history, Legal iconography, Maps, Netherlands, Palaeography on October 19, 2016 by rechtsgeschiedenis.